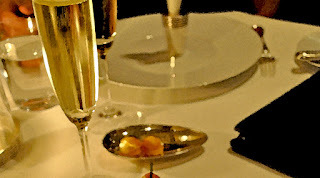 An evening at a restaurant usually doesn't go like this for me, but my wife and I are just two glasses of bubbly into dinner and have already added $48 to our wine bill. Then again, this is an once-in-a-lifetime dinner, as we're at the French Laundry, Chef Thomas Keller's original masterpiece, and to suddenly get too cheap when you're already $270 a person in for dinner (nine courses plus) and service makes you seem like the guy who doesn't get pot odds at the poker game. If you want to win big, at a certain point you've got nothing to lose. So you order that Schramsberg, "Cuvée French Laundry," Extra Brut, Blanc de Blancs, California 2008. It's creamy, bright, an evening's kick in the tuxedoed pants even if you're not that dressed up yourself. There's the old saw "It takes a lot of beer to make good wine," but Doug Margerum, owner of and winemaker at Margerum Wines, suggests, perhaps, a new saying: "It takes a lot of Amaro to recover from prodigious good wine consumption." 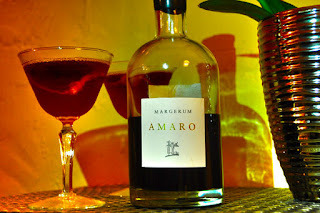 Margerum first got interested in Amaro -- the bitter yet beloved Italian digestif -- at wine events. "A lot of sommeliers drink a lot of Amaro, especially Fernet-Branca," he says. "But my interest in Amaro really peaked visiting Italy and tasting homemade Amari. After a huge meal and staying up all night and indulging, the evening always ended with Amari." He knows he is on shaky medical grounds, but wants to insist the Amaro helps settle one's system. If nothing else it shows the insight of the Italian culture with their words for love (amore) and bitter (amaro) so close in sound they're practically a slip of the tongue. 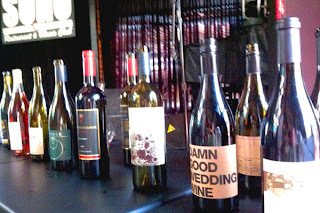 It's no surprise that the delicious Pinot Noirs and Chardonnays that Gavin Chanin makes for the Chanin Wine Company get called art. It turns out art is what Chanin studied at UCLA. "I do big abstract paintings, and for me painting is very physical and intuitive," Chanin says. "Wine is very similar. It's obviously very different tools, but it's not like you're sitting down and writing a question and answering it. You're taking a very basic material -- grapes or paint or some medium -- and turning it into something greater than it was before. You're transforming something without altering it or taking something away. It's a great and amazing process in some degree." Indeed, there are fortunates who developed their wine knowledge traveling with their families in Europe, their tastebuds sensing the circumflex in Côte de Beaune by the time they turned seventeen. More likely there are more families like mine, where I can't remember my dad drinking wine at all (perfect Rob Roys were his potent potable), and my mom, a Manhattan gal, had some large format generic Chardonnay opened for ages in the fridge for fish dinners. Forget declaring ABC (that is Anything but Chardonnay or Anything but Cabernet), when you order your next glass of wine, try NBT (Nothing but Trousseau) or AIFA (All in for Aglianico) or PPTP (Please Pour the Picpoul). At least that's what a wine event in Healdsburg this weekend is hoping to convince people, as they make a push for what they call the 7% Solution. No, they aren't Sherlock Holmes or Nicholas Meyer fans. That figure attests to the fact that roughly 93% of North Coast Appellation vineyard acreage is planted to eight major grape varietals. The event on Saturday, May 11th at Bergamot Alley aims to point out many other wonderful, if far less known, varietals. Don't be afraid; for every Tinta Cao or Ribolla Gialla there's a less out-there Mourvedre or Albarino into which you may tip your tasting toe. 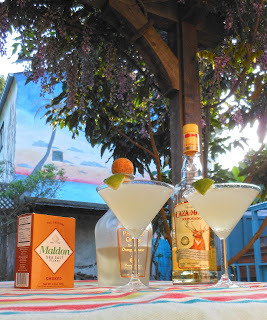 A should-be-classic, there might not be a cocktail as maligned as the margarita. Instead of existing as a bracing and bright accompaniment to serious Mexican food, it’s become a by-the-pitcher fuel for sweet-sippin’ inebriation, often in frozen and be-berried forms. So this year, celebrate Cinco de Mayo properly; put away that Jimmy Buffett CD, pour those pre-concocted mixes down the drain (do you really want high-fructose corn syrup in your cocktails? ), and take off that sombrero that makes you look like an idiot anyway. It’s time for a dignified drink, up, that allows for some variations but is all built from a standard base. 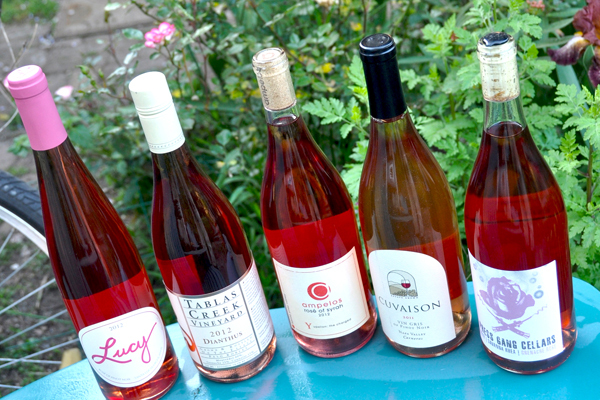 Come spring an oenophile's fancy turns to rosés. They definitely got a bad rap for years thanks to the proliferation of sickeningly sweet white zinfandels that began with Sutter Home in 1975. But even that wine was a mistake, a stuck fermentation that meant the yeast didn't eat up the sugars as it should -- the winemakers found the result interesting and when consumers went gaga for it, a new trend was born. Once again we learned that trends and taste aren't the same thing. Want to read the rest then do so on KCET's blog.